This transfer barge is based on typical barges used on western rivers. These operate all day long moving whole trains from one side of the river to the other. It is typical of the wood transfer barges used on inland waters, especially in areas where bridges were too expensive to build and maintain, conflicted with heavy river traffic, or subject to damage due to floods and ice. This double ended waterline barge will accommodate a maximum of six 40' cars with the double rail configuration. As with all large wood barges, king posts and hogging cables provided the necessary support. 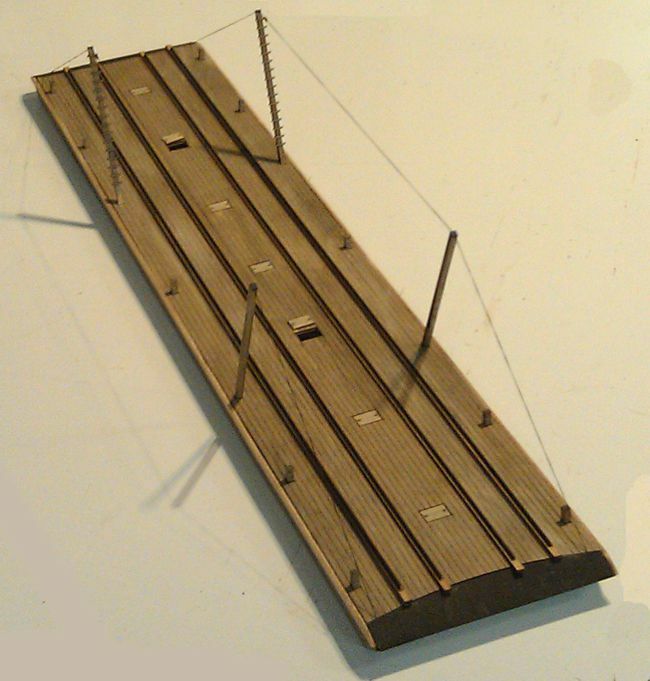 A crude wood ladder provided access to the cable turnbuckles for tension adjustments. Scuttle hatches allowed access into the barge interior for maintenance and the mandatory bilge pumping.